WILLIAMSPORT, Pa. - After falling in back-to-back games against nationally-ranked opponents, the Lycoming College football team will look to get back on track on Saturday, Nov. 1, when the head to Misericordia for a Middle Atlantic Conference game at Mangelsdorf Field. The Warriors (5-2 overall, 4-2 MAC) are coming off a 34-17 loss to 12th-ranked Widener. Senior Tyler Jenny completed 25 passes and threw for 281 yards in the game and junior Ryan Umpleby caught 14 passes for 203 yards and a touchdown. The Cougars (1-6 overall, 1-5 MAC) are coming off a 41-7 loss to Misericordia. Junior Jeff Puckett led the team with 106 yards rushing. • Junior Ryan Umpleby posted 14 catches and 203 yards against Widener, with both marks the third-best in program history. • With 1,286 career receiving yards, Umpleby needs 31 more yards to enter the top 10 in school history. 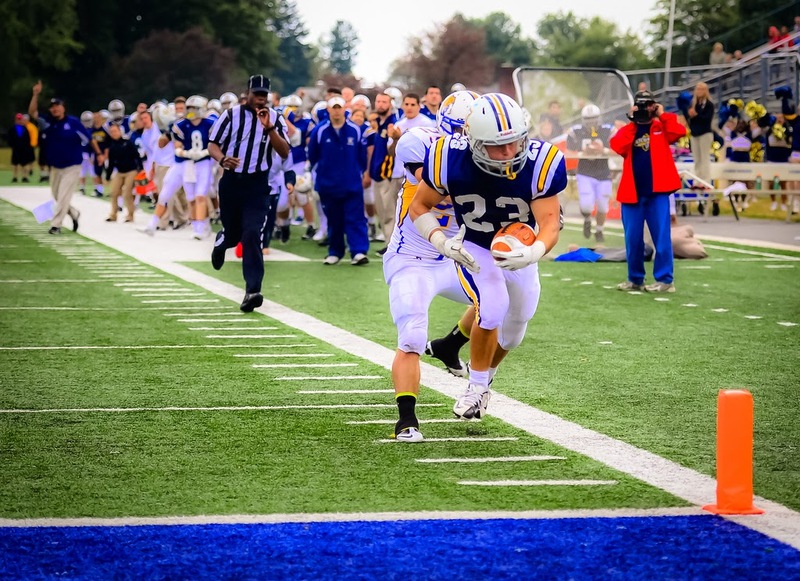 • With 192 all-purpose yards against Widener, senior Craig Needhammer broke the school record of 4,474 career all-purpose yards set by Josh Kleinfelter from 2007-10, finishing the game with 4,524. • Senior Tyler Jenny became the fourth player in school history to toss 50 in a career with his second of two touchdown passes against Widener. • Junior Cole Welham needs 1.5 more sacks to reach 10 in his career. • The Warriors need a win to clinch their fifth straight winning season. 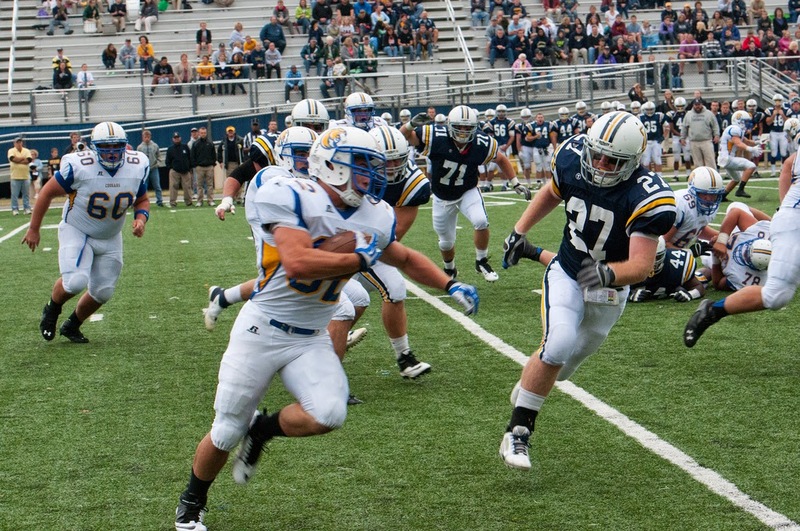 • Lycoming has not lost three straight games since 2010. 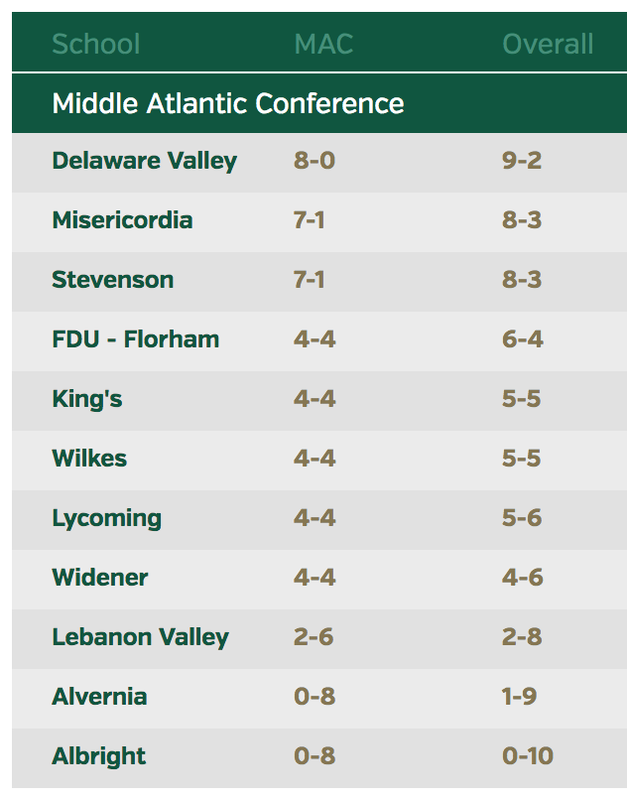 The Warriors enter the week third in the Middle Atlantic Conference with a scoring average of 30.4 points per game, while the team's 386.1 yards of total offense also ranks third. The Warrior offense is a three-headed attack, led by senior quarterback Tyler Jenny, who is third in the MAC in passing efficiency (156.1), touchdowns (16) and passing yards per game (250.1). He is second in completion percentage (.646). Senior running back Craig Needhammer is second in the MAC in rushing touchdowns (9), and fourth in rushing yards per game (95.7). His 157.1 all-purpose yards per game is also fourth in the league. 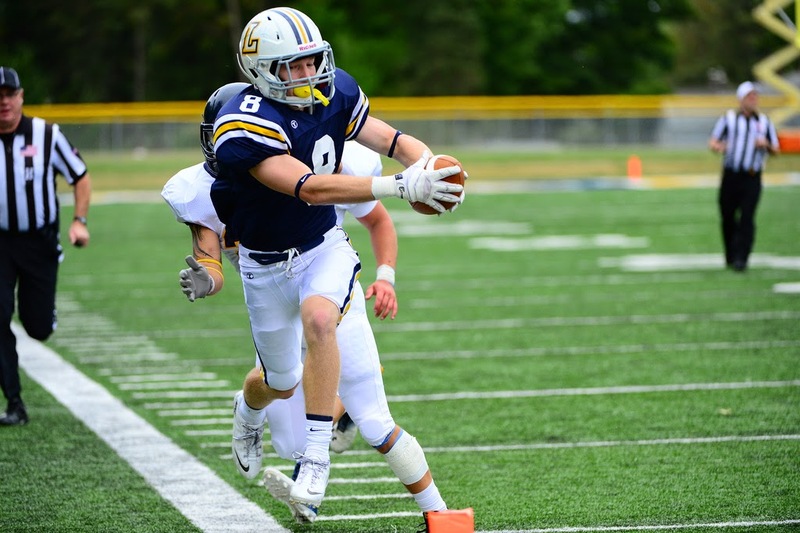 Junior wide receiver Ryan Umplebyis third in the league with 6.4 receptions and 95.3 yards per game, while his six touchdown receptions are fourth in the league. The Warriors lead the MAC in sacks (3.9) and feature one of the top defenses in the league, entering the week third in total defense (309.3), third in scoring defense (19.4), third in rushing defense (117.1) and fifth in passing efficiency defense (117.97). The Warriors have been able to consistently pressure behind the line of scrimmage, as the team has notched 55.0 tackles for loss this year. Junior Cole Welham is fourth in the league with 1.6 tackles for loss per game and he leads the conference in sacks with seven on the season. Senior Jimmy Nottingham is ninth in the league with 1.1 tackles for loss. Junior safety Mike Gentile has been a welcome addition to the backfield, as he is tied for the MAC lead in interceptions with four, and his seven passes defended also tops the league. Misericordia enters the game ranked ninth in the MAC in scoring offense (13.4), eighth in total offense (267.4), first in rushing offense (205.0), and 10th in passing offense (62.4). The team is led by junior quarterback Jeff Puckett, who is third in the MAC with an average of 106.7 rushing yards per game and fourth with six rushing touchdowns. He is eighth in the league with 153.9 yards of total offense. The team will play three different players under center, with sophomore Ryan Kurtz running for 61 yards against Delaware Valley and freshman Brandon Leap running for 46 yards and a touchdown. Kurtz is second on the team with 256 yards gained on the ground this year. The Cougars are ninth in the MAC in scoring defense (37.3), 10th in total defense (455.4), ninth in rushing defense (226.9) and 10th in pass efficiency defense (179.81). Sophomore linebacker Rob Hart leads the Cougar defense with 43 tackles while junior safety Brandon Salazar has added 40, including notching nine against Delaware Valley. Sophomore defensive end Donald Bender leads the squad with 4.5 tackles for loss and two sacks and freshman defensive lineman Fredo Santorelli has also added two sacks. Junior linebacker Dom Picarillo notched a 15-yard sack against Delaware Valley. The Warriors need a win today to clinch the program's fifth straight winning season. The current four-year streak is the second-longest in program history, as legendary former head coach Frank Girardi led the team to 29 consecutive winning seasons from 1975-2003. Senior Craig Needhammer, who holds the school's career rushing touchdowns (35), total touchdowns (38), points scored (228) and all-purpose yards (4,524) records, has his eyes on a few more standards as the second half of his senior year is nearing a close. Needhammer's 14 100-yard rushing games is one shy of the record of 15 set by Brian Thompson (1995-98). He is also 524 rushing yards shy of Kleinfelter's mark of 3,665 yards. The Lycoming defensive line has one of the best 1-2 combinations in the MAC, as both junior defensive end Cole Welham and senior defensive tackle Jimmy Nottingham are having breakout seasons. Welham leads the MAC and is 20th nationally with an average of 1.0 sack per game. Nottingham is fourth in the league with an average of 0.67 quarterback takedowns per game. Junior Ryan Umpleby has been on a roll, as the wide receiver has racked up 340 yards through the air in his last two games. The Forest Hill, Md., native is third in the MAC with 45 receptions and 667 receiving yards. He is beginning to edge into the Lycoming record book, with his 667 yards this year tied for 16th in the school record book and just 112 yards from the top 10. He also has 1,286 yards in his career, leaving him 31 yards from the top 10 in program history. With 801 all-purpose yards, he is 199 total yards shy of becoming just the sixth player in school history to notch two 1,000-yard seasons in a career. Junior Mike Gentile is another in a long line of defensive backs that have made huge impacts for Lycoming. Gentile picked off his fourth pass of the season against Widener, leaving him in a tie for the league lead with 0.57 picks per game. He could become the fourth Warrior safety in the past five years to lead the league in the category, as Ray Bierbach topped the league in 2010 (6) and 2011 (5). Ryan Fenningham tied for the league lead in 2011 (5) and seniorTanner Troutman tied for the national lead in the category in 2013 (8). Gentile also leads the league in passes defended (1.0).